Bill Hader (HBO's "Barry"); Nicole "Snooki" Polizzi; wedding planner Mikie Russo gives advice. 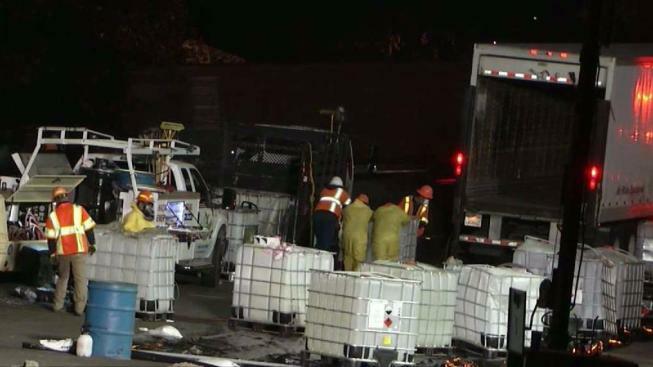 A big-rig overturned on a connector ramp from Interstate 880 to Highway 238 in San Leandro Wednesday, spilling a hazardous material and causing evacuations of a nearby building, according to the California Highway Patrol. The crash was initially reported shortly after 11:20 a.m. on the ramp from northbound Highway 880 to southbound Highway 238. A Caltrans building nearby was evacuated during the response, according to the CHP. Minor injuries were reported to the driver of the big-rig. The vehicle was leaking acetic acid, CHP Officer Kevin Bartlett said. The acid also got into a storm drain, which emergency crews blocked off with an inflatable plug. The roadway was closed for over 12 hours until crews cleaned up and cleared the scene just before midnight.